At the moment I’m working quite hard on a couple of recordings I’ve got in progress. I’m a one-man-band kind of guy, playing all the instruments, and recording and mixing the tracks myself. That necessarily leads to a certain way of working if, like me, you have a full-time day job. I fit recording and mixing work into spare hours and half-hours whenever they occur, or save up a few tasks to justify the effort of setting up a drum kit, or a guitar-and-amp rig, and placing microphones. In the past, when I was a freelancer and worked from home, I could block out chunks of time to record pretty much whenever I wanted to, and could have the recording of a song mixed within 24 hours of writing it. Nowadays it takes a few weeks usually. It’s a drawn-out, accretive process. This way of working is dependent on the ability of DAW software to recall every aspect of the audio project for me. I load the project file in my DAW of choice (Cubase), and every channel is the way I left it: all the inserts are there with exactly the same settings I was using before, the tracks are all routed to the same busses, all my automation data is the way it was last time. What would take hours of work in the analogue realm is reduced to the 30 seconds or so my laptop and edition of Cubase require to load a complicated project. The implications of this technology for the way music is mixed and the way it sounds when you hear it on the radio are enormous, and are probably only truly understood by recording engineers, especially those who learned their trade during the analogue era. Almost any record you care to name from the pre-digital era (digital recording that is, not digital playback) has flaws or idiosyncrasies in it that could have been ironed out with one last recall session, but which weren’t worth the time and effort required to do the recall. If you were working on analogue tape with a console, doing a recall to make a couple of tweaks to the vocal level was an expensive luxury few could afford. To allow the tweaks to be made, the engineer or the engineer’s assistant would have to reconstruct the mix on the desk, using notes and snapshots taken during the previous session. Hardware audio processors would have to be re-inserted over the correct channels, tracks bussed appropriately, EQ settings precisely dialled in. It took time, and it wasn’t always easy to get everything exactly the same. An engineer skilled at quickly and accurately recalling a mix was worth his or her weight in gold to a producer or mixer. Even so, a band was unlikely to get the producer to consent to a recall unless the producer felt the tweaks the band wanted were justified. A recall meant 3-4 hours’ work, and time is money in the recording studio, as it is anywhere else. Digital mixing consoles began to include some recall functions in the 1990s, which sped up the process a bit, but these desks rarely sounded as good as the real analogue deal, and they only went so far: no console can actually plug in an LA2A for you. It was the DAW that allowed the situation we have now, where any mix can be perfectly recalled, tweaked and printed (that is, mixed down to stereo) whenever the band or producer want. As with anything else, it’s a double-edged sword. When listening to other people’s music, I may decry the primped sterility of the end result: recordings that have been airbrushed to within an inch of their lives, where every instrument and vocal performance is in fixed audibility at all times in a way that could never happen in a live performance captured to tape, and with no technical flaws or blemishes, no matter how tiny, allowed to make it through to the master. Yet I’m dependent on that same technology to make any recordings at all, and I’m as guilty as the next man of stewing over a mix for several days before going back in and systematically fixing all the things that bugged me about the last version. So what else is new? Replace “digital mixing” with “CGI” and let a movie buff give you their cri de coeur on the superiority of in-camera practical effects work. This is simply the world we live in. When you next hear a brand-new recording straight after a classic on your iPod or on the radio, listen to the differences. Feel them. I know which I prefer to listen to, and sadly, I also know which kind of recordings I’m making. This entry was posted in Music and tagged airbrushing, analogue recording, analogue-vs-digital, assistant engineers, automation, bussing, CGI, Cubase, DAW, digital audio, digital recording, engineering, inserts, LA2A, mixing, mixing engineer, plug-ins, recalls, software, sound, sound recording, Sound recording and reproduction, studio on May 13, 2016 by rossjpalmer. 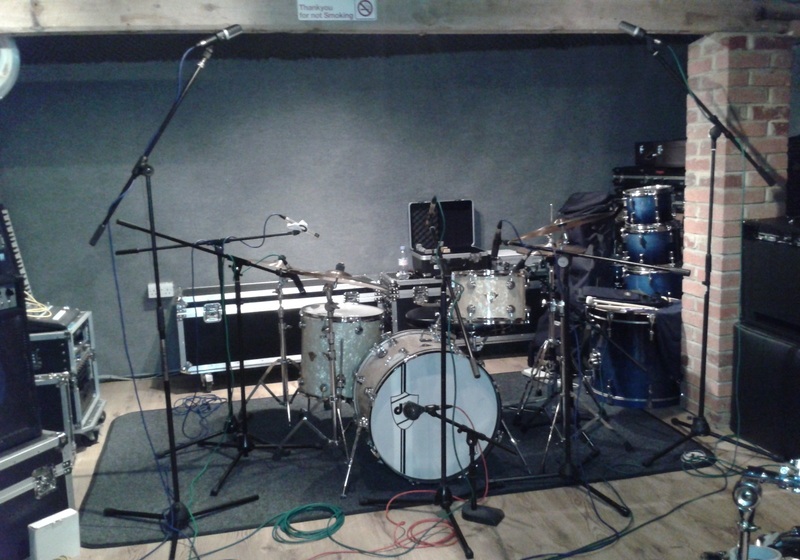 I’ve talked a lot about recording drums on this blog. Here are just a few more thoughts. They’re not technical, I promise! Yesterday, rather than spending a day at home doing freelance work and stealing an hour or so to write a blog post (which tends to be how my Thursdays out of the office go nowadays), I went to Shack Studio in East Hanningfield, Essex, to spend a day tracking drums with a very fine engineer called Grant Matthews. Grant’s recording experience goes back to the analogue era, so he is, by my reckoning, a proper engineer. He’s done all the hard stuff you have to do when working out of the box: aligned tape machines; cut takes together on tape; worked with hardware gates and compressors; done submixes to tape knowing that mix was going to have to be right, there and then, on pain of recording it all again; dropped in and punched out during vocal overdubs, risking accidentally messing up a good vocal track with a bad edit. Guys like this think differently to those who learned in the digital era, who tend to learn, and therefore think, from the software back. Grant thinks (I would guess, from watching him work) from the microphone forward. Anyone who’s worked entirely in the DAW era (that is to say, anyone who began their working life in the late 1990s) is now at least in their mid-30s. Which is to say that in the next ten years or so, people who have Grant’s knowledge and experience are going to become harder and harder to find out in the wild. A lot of them are out of the business already, victims of the death of the demo studio. Briefly, because this will be old news to many of you, there used to be a lot of demo studios around. Recording equipment was relatively expensive and hard to use without some measure of training, so bands tended not to record themselves, as they couldn’t come anywhere near the results a real engineer could get. This changed somewhat with the advent of the four-track Portastudio, but cassette-based multi-track recording devices are an inherently lo-fi proposition, so a studio with an 8- or 16-track reel-to-reel tape machine was still the place to go for an impressive recording. Bands would book a couple of days, the engineer would record them playing live, they’d do vocal overdubs, maybe a couple of extra instrumental parts, the engineer would mix, and give them a cassette or CD, and the band would have a demo or a single or whatever to send to local radio, sell at gigs, push to labels and promoters and managers, and so on. When the digital audio workstation (DAW) became a viable proposition in the late 1990s (a development that had been a long time coming – computers had to reach a certain level in terms of processing power and speed before 24-track+ in-the-box recording and mixing was a genuine possibility), and when folks started cracking pro-level software (Cubase SX3 was cracked within minutes of being released), musicians realised that they could, with maybe £500, buy an interface and a few microphones and record themselves on the computer they already owned, without any need to go back to that demo studio. This was in maybe the early to mid-2000s. At that time, I was in a band, and while I did record at home, and loved doing it, the limitations of my equipment (I had a 2-input soundcard so couldn’t record a whole band with that) and lack of engineering knowledge meant that we went to a studio to do when we wanted to make real recordings (the aforementioned Shack Studio with Grant). Even if we’d owned a lot equipment, we knew we couldn’t use it properly and would get crappy results left to our own devices. Not every musician felt similarly, though. Within a few years, smaller studios were closing at a rate of knots. Bigger studios, too, as major-label budgets shrank (this also being the post-Napster world), and professional bands began limiting real studio work to drums and orchestral overdubs, doing vocals, guitars and programming work at home to save cash. All of this fed into the precipitous decline of audio quality that we now live with. But that’s a nail I’ve pounded on enough times. As I said, yesterday I went into the studio with Grant, and we recorded some drums. I began recording drums at home principally because for a few years he got out of the game, and there wasn’t anyone locally I felt could do the same job he could, so I was going to have to learn to do it myself. I’ve recorded drum tracks a lot over the last four or five years, and some of the ones from the last couple of years have even sounded pretty good. But there’s nothing like working with someone who knows more than you. It’s a joy. As a client, I came away with drum tracks that I think sound great. And, as an audio engineer who knows a bit but still learns something every time I plug in microphones, I got to watch a pro do something with ease that comes pretty hard to me. It’s something I’ll be doing again, I think. These are just observations. I know that some folks have got very into their work as home recordists. I understand that. I have, too. It’s great. But sometimes it’s good to be reminded of what you lose when you decide to go down that DIY route: great gear, really good sounding tracking rooms and the expertise of people who’ve got tens of thousands of hours of studio time under their belts. This entry was posted in Gear, Music and tagged ambience, analogue recording, Audio Engineer, Cubase, DAW, digital recording, drum sounds, Drums, Grant Matthews, microphones, music industry, napster, portastudio, Pro Tools, production, record production, recording drums, Shack Studio, sound engineer, sound recording, Sound recording and reproduction, stereo miking on July 3, 2015 by rossjpalmer.